The history of 'Silver Tom' (1898) is inextricably linked to the short and interesting history of his young owner, the Hon.Philip Wodehouse, son of Lord Wodehouse, the second Earl of Kimberley, of Wymondham, Norfolk. 'Silver Tom' is also one of only two 'Shaded Silvers' to make any impact as breeders, the other more successful male, being Mrs Ormerod's 'Lord Nugent' (born in 1899), himself by the well-known 'Lord Argent'. In the main, the quest for the so-called Self-Silver, became the quest for the Chinchilla. Those of a darker hue and tipping being referred to as shaded silvers. The problem was, that it was extremely difficult to decide in which camp a cat belonged, as even the lightest coloured silvers were still shaded to some degree and some more-so than others. The young Philip Wodehouse became a cat hobbyist early on, and given that his date of birth is listed as 1st October 1886, he cannot have been more than 12 years old when he purchased and exhibited his first Silver Tabby female 'Silver Saint' from Mrs. W.P Cubitt. Later, he would also purchase the Blue Tabby queen, 'Blue Hyacinth' from the well-known Miss Jay and registered her under his 'Witton' cattery name. 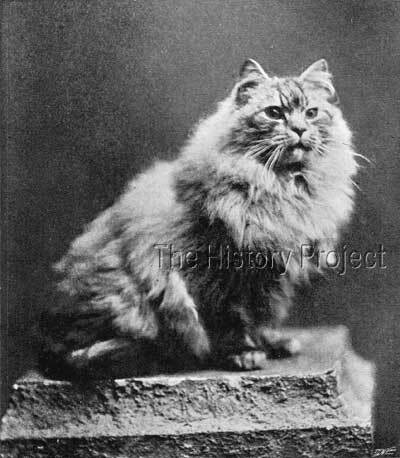 By the time his litters were registered in late 1901 he would have been only barely 15 years old. Sadly, Philip became one of the tens of thousands of young men who went on active service during the Great War, the result of which was that he died at the age of 32 on 6th May 1919. Through his dam, 'Abbess of Bromholme', 'Silver Tom' was a worthy grandson of Lord Southampton, the inimitable and most popular son of Ch. Silver Lambkin. 'Silver Tom' was born in April 1898. He was bred by Mrs. W.P. Cubitt, a well-known and respected breeder of Silvers, from her stud male 'Monk of Bromholme' and her queen 'Abbess of Bromholme'. Although we have no information relating to 'Monk', we do have the background of 'Abbess'. She was registered as a Shaded Silver (probably a light shaded silver), born 29th March 1896. Her sire was among the top tier of Chinchilla males in the country, the highly sought-after 'Ch. Lord Southampton', (Chinchilla) and her dam was 'New Forest Fairy'(Chinchilla). 'Lord Southampton' was regarded by many as the premier Chinchilla living, being as he was the line-bred grandson of 'Beauty of Bridgeyate'. Thus he was seen as the replacement for, and an improvement on, his illustrious sire 'Ch. Silver Lambkin' with his dam being his sire's half-sister. Although we have no way to confirm this, it is our belief that 'Silver Tom's' sire 'Monk' is highly likely to also have been related to 'Abbess', as it was highly desirable to line-breed when creating silvers and looking for the clearest possible colour. Certainly when looking at the full photo of 'Silver Tom' you can see how cobby and short of body and leg he is, and in this respect at least he very much resembles his early forebear, 'Ch. Silver Lambkin'. EDITOR'S NOTE: In this quotation, 'Abbess' is now clearly referred to as a Chinchilla, whereas her registration was as a Silver (open to interpretation!). 'Dimity' is 'Windsor Dimity', This connection to the litter sister of 'Abbess" is very significant as 'Windsor Dimity' went on to be the dam of two very famous males and another important female. She is the dam of 'The Absent-Minded Beggar' by 'Lord Southampton' and 'Puck III' sired by 'Silver Starlight', the stud owned by Princess Victoria of Schleswig Holstein. She was also the dam of 'Silver Charm', owned by Lady Decies. So, on the whole, although 'Silver Tom' did not himself rise to great heights as a show cat or as a breeder, he was closely related to some of the very best chinchillas in the country. He was sold to the young Hon. Philip Wodehouse as the foundation male for his new cattery. Both 'Silver Tom' (Shaded Silver) and 'Silver Saint', were bred by Mrs. W.P. Cubitt, and owned by The Hon. Philip Wodehouse. 'Silver Saint' was subsequently bred to Miss Derby-Hyde's 'Silver King' by The Hon. 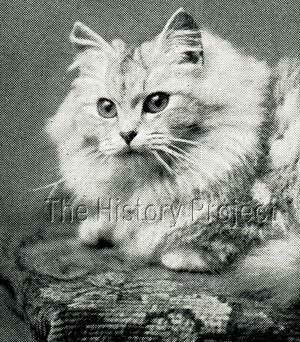 P.Wodehouse to produce 'Silver Twilight', a Silver Tabby female, born 15th July 1901, that he retained for breeding. At the time of writing, no show records for 'Silver Tom' are available. BLUE NYMPH - Blue Tabby Longhair Female, bred owned by The Hon. P. Wodehouse. FORGET-ME-NOT - Blue Tabby Longhair Female, bred owned by The Hon. P. Wodehouse. SILVER RING - Shaded Silver Longhair Female, bred and owned by The Hon. P. Wodehouse. GOLDEN RAY - Cream Longhair Male, bred and owned by The Hon. P. Wodehouse. Sadly, young folk sometimes have to make hard decisions, such as when the time is right for a favourite hobby to come to an end, to make way for other important life realities. The below listed advertisement, in which Philip seeks to dispose of his beloved cats, appeared in the 10th October 1903 issue of 'Our Cats'. How hard it must have been for him to part with his much-loved and prized companions! 'Our Cats' 10th October 1903.